I come from the generation where one had to learn how to take criticism and feedback in order to become better. If one didn’t make the cut, it meant working harder to get more skilled or attaining more education. My success was dependent upon what I put into the effort. If I failed, it was my fault for not persevering. In this day and age, it seems that those lessons are gone. It’s not about working hard to attain a goal. It’s been said many times that the millenials are behind the anti-GMO movement. This is the same generation that wants their bosses to give them everything in their workplace and that the work has to fit to their standards. It’s not about giving it your best shot either or taking the initiative to do something more than what’s ask. Do only what you must and that’s it is the attitude. A friend of mine, who is a millenial herself, even recognizes this attitude shift. She aptly calls it the “everyone gets a trophy” mentality. It doesn’t matter what you do or how hard you try, you’ll get something. Then no one should ever face criticism either because feelings will be hurt. 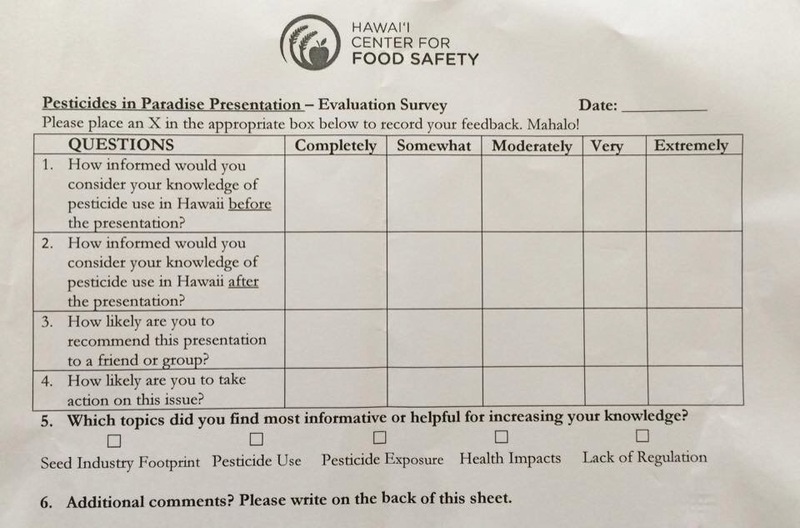 This was a feedback form given at the Waimea Center for Food Safety’s Pesticides in Paradise “educational” meeting a few weeks ago. If you read the rating criteria, there is clearly no room to give critical feedback of Ms. Lukens’ presentation. It’s almost laughable that the scale is clearly not made accordingly to social science ratings and is at the extreme end of the spectrum. Essential the rating scale goes from you’re good to you’re super good. What does this mean? You have to completely buy their cherry picked “data” and mounds of “information” without any critical assessment of it. There is no room for questioning what radical environmental groups tout. That’s why to them, it’s their way or no way and no potential for working together ever. Should we be surprised that Lukens dusted herself off after facing over a hundred Molokai farm workers questioning her “facts?” She couldn’t back her allegations of farms poisoning children so instead of coming clean about the truth, she turns to a new tactic of manipulating people at a children’s hospital with her ideologues. There is no thought about what is decent behavior which is clear when these groups never call for people to stop calling for crop destruction or vandalism. I’m starting to think that they cannot see bad behavior and that increases the potential for more bad behavior. She decries that others are wreckless in their work, yet her full time job promotes disinforming the public about biotechnology and pesticides. That’s not how we did things during our small kid time. Nor is it how communities can thrive with the toxicity that the Center for Food Safety creates across our state. Finger pointing without evidence at school is called bullying and frowned upon. However, it’s tolerated and even celebrated by radicals. I would never encourage my child to ignore bad behavior as that shows acceptance of it. This is how they want our communities to remain and it’s sad. Of course, the CFS doesn’t live here so they have little investment in what happens to our islands. They are almost like a migratory pest that goes from place to place bringing destruction for a short term gain and then leave the place decimated. Many people don’t understand why I speak out against these attacks against the biotech communities. I don’t defend them but I defend the tools that they use as my dad’s farm uses it too. If these activists can take away access from large companies, it’s quite plausible that they will take away the small farmer’s access. Remember that Earthjustice and the CFS said they weren’t going attack small farmers yet they are intervenors on the Big Island GMO ban being appealed in court. The large companies have the financial backing to weather through this but for the long time Hawaii farmer, they stand to take our life that we get from the land. The life of the land is in the people. We can’t ever forget that. Those who are paid to divide communities are finding that they are not going be given a trophy by the local folks. This is correct! The anti movements in Hawaii is tearing our communities, families, and friendships apart slowly. When the antis can’t even come to the table like civilians, how can they expect us locals to give the same respect? Yet we do! Over and over again. Yet the antis are weaving stories of their own experiences. Liars. How shame! They need to go back to the mainland. Kauai Girl, No thanks we don’t want them on the mainland either. Try putting them on boats to North Korea. They are here to stay but it means that the local voices must come out loud and backed with facts. We call this ‘The Merit Badge Syndrome’ in our house… A lady once explained to me that ‘we don’t keep score during the soccer game, that way everybody wins.’ Yeah a victory today equals a loss for society in the future. Keep on writing, we all love your views. Mahalo for your thought and support. I can’t sit back and let all of this unfold in my home state. It’s not going to help us for the future. It is Dr. Lukens, not Ms. Lukens. And face it: she is winning, so she really does not need a “participation” trophy. Just because she’s a doctor doesn’t make her an expert about the issue she’s talking about. What expertise does a political science PhD have to do with farming? Is it in her scope of practice? I did not say she was an expert. I just said she is “Dr. Lukens” not Ms. Lukens. You’ve probably realized this by now, but this has nothing to do with farming. It is politics, plain and simple. Which is obviously why CFS hired a political scientist. Yes, CFS invested in Hawaii to rip apart communities with her style of dishonest politics. She is not winning for 2 reasons. She is spreading lies, and the farmers were there to oppose her bunk. I hope they keep it up. If she really won, GM technology would be banned and she’d be back on the mainland.